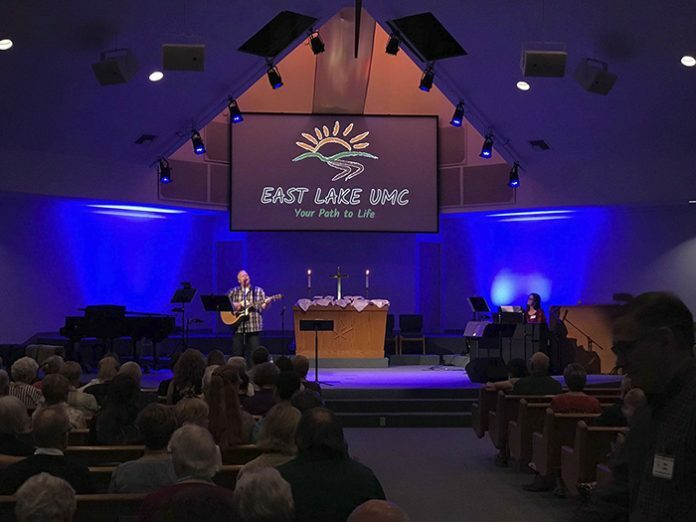 Energy efficiency was top of mind for East Lake United Methodist when the church contacted All Pro Integrated Systems about adding LED lighting to its sanctuary. So too was the ability of stage lighting to contribute to a dynamic worship environment. All Pro delivered both when it installed 12 Chauvet Professional Ovation E-260WW fixtures as part of a lighting/video upgrade. But the warm white ellipsoidals also offered a third benefit that the church hadn’t thought of: flexibility. Balancing stage lighting with background lighting has also created a more camera-friendly stage for videoing services without detracting from the live experience, according to Jacob. “There were a lot of talented people involved in this project, helping us a achieve the balance between lighting for the camera and the live audience,” he said. “All Pro would not have not been able to complete the project without the strong leadership of Jacob Robinson, our project manager. Mark Salamone, our project salesmen; Sarah Giles, the project designer; and the church’s main point of contact, Jonathan Hinton, were all instrumental. You always want to enhance the broadcast element of a church’s lighting, while at the same time preserving all of the dynamic looks for the people who are there worshipping,” he commented. Helping to achieve this balance is the intense output of the Ovation E-260WW. “I never fail to be impressed by the brightness of this light,” said Jacob. “The church doesn’t even have to use the fixtures at full intensity. Everyone at East Lake United Methodist has been surprised by that. This project opened a lot of eyes to what kind of impact good LED lighting can have on a church.